Pontiac Torrent cabin air filter location. From year 2006, 2007, 2008, 2009. Here you can find where to locate Pontiac Torrent cabin air filter when you need to change. Where is located cabin air filter on a Pontiac Torrent . Maintenance of a vehicle differ from a car to another. If you car service is approaches, below you can see how to replace cabin air filter. Cabin air filter is located outside of the car, under the plastic panel from passenger side of cowl. Remove windshield wipers or put them in upright position and then open the hood. With a screwdriver remove pins from passenger side of cowl. Remove passenger side of cow. Be careful, on cowl remains attached wipers fluid hose. Insert new Pontiac Torrent cabin air filter in the cabin air filter housing like in picture bellow. For more guidance feel free to ask about how to replace the air conditioning filter for Pontiac Torrent . If you want to reset service light reminder on Pontiac Torrent click here. How to locate if you need to change cabin air filter, oil filter, fuel filter, pollen filter, dust filter or air filter on Pontiac Torrent . Why is necessary to replace the cabin air filter? 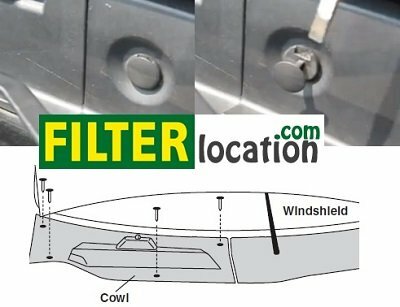 Is necessary to replace this filter to protect you and your passenger from bad odors, some allergen, from pollen and is very important if somebody from your car is allergic to pollen, dust and other particle.